Truckers are used to driving through all kinds of different road conditions. From roads slick with wet leaves, rain, or black ice, truckers have the skills and experience to know how to be safe on the road. For those truckers who are new to the industry, this can take a little practice, especially since it takes time to simply adjust to driving a bigger vehicle. Here are some tips for driving safely in fog. Did you know that many drivers subconsciously speed up while driving through fog? We all know that it’s safer to drive slower in foggy weather, but because fog obscures your vision it gives the appearance that you’re traveling slower than you actually are. Many drivers will think they’re driving too slow when they’re actually slowly speeding up! Whenever you’re caught in fog, be sure to keep an eye on your odometer to make sure you know exactly how fast you’re going. Some drivers feel like having their headlights on blinds their vision. However, turning your headlights off essentially makes you a “ghost truck”. The point of having your lights on in fog is so that other vehicles can see you coming. Be sure to use your low beams or fog lights, and never use your high beams! Just a little bit of light helps you to be seen without obstructing your vision too much. If the foggy weather becomes so bad that you can only see a couple feet of the road ahead of you, a good trick is to keep your eye on the pavement line on the right side of the road. This will let you know when the road is turning so that you can turn your vehicle with it. Drivers tend to subconsciously steer towards lights, so keeping your eye on the pavement lines will help you stay in your lane. Just make sure that you’re not fixating and that you’re staying alert of your surroundings! 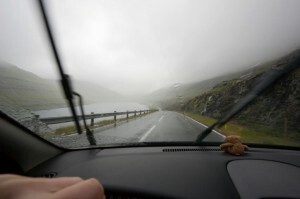 You should never drive in dense foggy weather if you think you may risk an accident. Especially if you are a new trucker, you should get off the road if you feel uncomfortable. Try pulling into a parking lot or rest area. If the only place to pull over is the curb, be sure to get as far away from the road as possible, even driving into the grass if there is any. After you’ve pulled over, be sure to turn all your lights off! Leaving your lights on may cause other drivers to think you’re still on the road and rear end you. If there is shelter nearby you can go there, and if not, stay in your truck. Dense fog usually doesn’t last for too long unless you’re in a valley where fog settles. You should soon be able to return to the road to complete your trip, driving safely through what’s left of the fog. But keep in mind, stopping on the side of the road should be a last resort! Whether you are concerned about your health on the road or looking to upgrade your safety while driving, you can rely on Baltimore Freightliner-Western Star. We have provided top-notch service for the trucking industry for 30 years and would love to assist you in buying a new top-of-the-line truck, finding the specialty parts you need, or repairing your truck. Give us a call toll-free at 800-832-7278 or locally at 410-685-4474, or contact us online. To find out more about what we are up to, follow us on Facebook, Twitter, Pinterest, and Google+. This entry was posted on Friday, September 23rd, 2016	at 2:20 pm	and is filed under Trucking Lifestyle	. You can follow any responses to this entry through the RSS 2.0	feed. Both comments and pings are currently closed.